This Management of Organization Review (MOR) special issue aims to explore the key features of the innovation and entrepreneurship ecosystem in India. There is recent evidence that innovation and entrepreneurship dynamics in transforming economies differ from like processes in advanced market economies in significant ways (e.g., Maimone, Mudambi, Navarra, & Baglieri, 2016). Therefore, applying the dominant theoretical lens developed to study innovation and entrepreneurship in advanced market economies may be inappropriate. For instance, the Global Entrepreneurship Monitor (GEM) surveys clearly demonstrate the composition of total entrepreneurial activity (TEA) for advanced and transforming economies is substantially different, with a significantly higher level of ‘need-based’ entrepreneurship in the latter. Hence the typical advanced economy transition from wage employment to a larger share for entrepreneurship may be reversed in transforming economies. Transforming economies also witness a significant role of the transnational diaspora in their entrepreneurial and innovation processes (Riddle, Hrivnak, & Nielsen, 2010). Further, at the level of corporate entrepreneurship, London and Hart (2004) argue that results of studies of subsidiary entrepreneurship undertaken in advanced market economies may not generalize to transforming market economies. In summary, a fundamental question is whether entrepreneurship and innovation in transforming economies are diverging from the norms of advanced economies as these countries get wealthier and develop entirely new trajectories (Hill & Mudambi, 2010). from Part II - Unique capabilities of EMNCs: do they exist? As recently as the late twentieth century the archetypical multinational enterprise (MNE) was a hub and spoke system with the hub located in an advanced market economy, the major nodes located in other advanced economies and the minor nodes located in the rest of world. The main challenge of such an MNE was balancing local responsiveness with global integration (Bartlett and Ghoshal, 1989). By this time, Vernon’s (1966) product cycle model was becoming less applicable to finished goods and services, but it was still alive and well for knowledge creation. Innovation was still largely concentrated in advanced market economies and ‘exported’ to middle and lower income economies. A key phenomenon of the early twenty-first century is the rise of emerging markets as players in extant global research and development (R&D) networks, as centres for development of new business models and as sources of ground-breaking yet ‘frugal’ innovations (Govindarajan and Ramamurti, 2011). As part of this trend, we have witnessed the appearance in world markets of competitive multinationals based in these markets (Khanna and Palepu, 1999a, 1999b). There is general agreement that such emerging market multinational enterprises (EMNEs) are becoming more important and that they do not fall into one or even a few easily recognisable categories (Mudambi, 2008; Ramamurti and Singh, 2009a). There is evidence that emerging market firms face significant resource and institutional gaps in their home markets requiring them to develop competencies to cope with these hurdles (Khanna and Palepu, 1999a; Cuervo-Cazurra and Genc, 2011). However, given the specific nature of local contexts (Meyer et al., 2011), it is unclear how these firms translate their locally relevant competencies in order to compete in global industries. Hence, there is much that is not understood about the process whereby EMNEs arise, survive and thrive. I will argue that the business firm is properly viewed as a political system and that viewing the firm as such a system both clarifies conventional economic theories of the firm and … suggests some ways of dealing with classical problems in the theory of political systems generally. The above quotes exemplify the reality of the functioning of all large and complex organizations. Large business firms in general and multinational corporations or companies (MNCs) in particular form a large and important set within this group. Yet most theories aimed at explaining the functioning of business firms, both in strategic management and economics either ignore the political dimension of the organization, or treat it as an aberration. In the mainstream literature, the strategy of business firms has traditionally been accepted to be the creation and maintenance of competitive advantage. As noted by Mintzberg (1979), the operation of a business firm gives rise to both cooperation and conflict. Conflicts can arise between owners and managers in the division of the value created by the firm as well as amongst managers in the struggle for power and control rights within the firm. It is this latter set of conflicts that is the subject of this very topical volume. On March 27,1994, after about forty years of proportional representation, national elections to both chambers of the Italian Parliament took place governed by an electoral system with a strong element of plurality. Since then Italy has held one more general election under the new rules (in April 1996). In the present study, we will be concerned with observing and explaining some of the effects of the new rules on the voting behavior of the Italian electorate. Our analysis will focus on the most recent election to the Chamber of Deputies (the lower house). The rules for the Chamber of Deputies are as follows: approximately three-quarters are now elected on a plurality basis, while the remaining quarter is elected proportionally and essentially on a regional basis. This is operationalized by allowing voters to express two simultaneous votes: one for the single-member college candidate (a Plurality [PL] ballot) and the other for the party for the proportional allocation of seats (a Proportional Representation [PR] ballot). Since each voter has two simultaneous votes available, he or she can express a double preference for a party, by voting for it in the PR ballot and for that party's candidate in the PL ballot. Alternatively, the voter can express split preferences by voting for a party in the PR ballot, but not for that party's candidate in the PL ballot. This phenomenon, that can be described as a “switching-voter phenomenon” (Navarra, forthcoming), can significantly influence the overall results of the elections and, consequently, the formation of the government. Constitutional political economy is an intellectual endeavor in which the notions of efficiency and justice are necessarily balanced. Justice should emerge naturally from a constitutional process, whereas efficiency must be achieved through conscious effort. All the key issues in constitutional political economy relate directly or indirectly to one of these two notions and most to the interplay between the two. Fundamentally, we are concerned with the development of formal “rules” within informal structures in order to regulate all human actions. 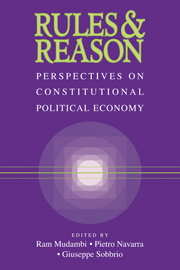 Considerations of efficiency are in the realm of positive economics, that is, the analysis of questions of “what is.” Notions of justice, however, fall within the purview of normative economics, that is, the examination of questions of “what should be.” Constitutional political economy concerns the legal foundations of the market. The legal infrastructure is operationalized through a set of rules and regulations that can be thought of as signals indicating the domains of choice. It follows that these rules influence outcomes – a concern of positive economics. Further, some outcomes are “better” than others, which introduces issues related to comparisons of different sets of rules – a normative consideration. Public choice is concerned with the development of a rigorous axiomatic general theory of government. In this view, politics is understood as a marketplace for individual exchanges. Within this marketplace, rules and regulations function as constraints on individual and collective action. These rules are implemented according to the institutional framework of the nation-state. Part I is made up of contributions that examine the theoretical underpinnings of constitutional political economy. Do constitutions matter? Mueller's answer to this fundamental question is that they can matter, although they do not necessarily do so. The many Brazilian constitutions have had limited impact. In the former USSR, the constitution had some admirable sounding sections but did not produce an admirable political system. In contrast, ancient Athens, the Weimar Republic, and Costa Rica are three cases where constitutions have had important effects. The main message of this chapter is that written constitutions can matter in how well the political institutions of a country function. Vanberg focuses on economic systems and the framework of rules and institutions that constrain the actions and transactions of economic agents. He argues that this framework, which may be called an “economic constitution,” determines the ability of the system to adapt to a changing environment. This insight is used to analyze the current debates on globalization and the conflict between protectionist and competitive interests. The analysis of Buchanan and Yoon can be understood as a more abstract approach to the issue of a changing environment. In particular, dropping the “natural” distinction between rules (constraints) and outcomes within such rules, the argument is made for choosing constitutional variables (constraints) based on efficiency considerations. The bipolar world during the Cold War pitted the free democracies of the West against socialist dictatorships. During this period, the socialist states offered the Hobbesian goal of order, while the democracies adopted the Lockeian perspective. Electoral system choice, especially the distinction between proportional representation and the plurality forms of electoral rules, is widely regarded by political scientists as one of the fundamental institutional decisions made by a democratic polity. Part II is made up of contributions that examine the operation of the systems and institutions of representation. Grofman and Reynolds provide an overview of the current state of knowledge and of the cutting-edge areas of research. This includes a panoramic view of such issues as votes–seats relationships, party proliferation and government stability, as well as the nature of partisan bias, incentives for strategic misrepresentation of preferences, incentives for voter turnout, and incentives for localism and corruption. Mudambi and his colleagues take a practical look at the effects of electoral rules on coalition strategies in the context of Italian national elections. The rules in question are an attempt to move away from a proportional system toward one incorporating elements of plurality. Since elements of both systems are present, their effects on political coalition strategies can be studied. Paul and Wilhite, on the other hand, examine the plurality system in U.S. congressional elections, focusing on effects of campaign finance considerations. Many important characteristics of government are not included in formal constitutions. These include the organization of public administration and its relationship with the polity and, in many federal systems, with the local and regional government. It is generally argued that voters are neither interested in nor capable of exerting influence on these aspects of government. Constitutional design for a federal state generally focuses on things like the policy jurisdictions of federal subjects, representation in and the authority of the national legislature, the nature of federal and regional courts, and procedures for amending the national constitution. Once these matters are settled, attempts at ensuring stability typically focus on economic matters like tax policy, revenue sharing, trade policy, and regional investment. At both stages, there is an inherent conflict between federal subjects and the national government. One question therefore dominates all others: How do we achieve stable and enforceable rules that guarantee the rights of subjects and allow for the evolution of these rights, and at the same time ensure the authority of the national government? Filippov and his colleagues argue that the key requirement for stability is the establishment of a set of incentives whereby political elites at one level find it in their self-interest to cooperate and coordinate with elites at all levels. Frey and Eichenberger extend the notion of federalism further by integrating it with genuine political competition. They define and develop the concept of Federally Overlapping and Competing Jurisdictions (FOCJ) and relate it to current developments within Europe. In Part I, Mueller pointed the importance of institutions as the foundation upon which constitutions, as sets of rules, can function or fail to do so. Here, Forte provides a practical illustration of this insight in the context of the Maastricht excessive deficit rules of the European Union. Polarization in Western democracies and the collapse of centrally planned economies have led to calls for a redefinition of the state's core functions. This volume explores shifting conceptions of constitutional political economy anchoring the state from the viewpoints of theory, systems, and applications. It suggests why changes may be desirable and how these might be implemented. Part I addresses the writing of constitutions, the dynamic between constitutional order and civil society, the struggle between competitive and protectionist interests, the conflict between protecting expectations and moral evolution, and the role of cultural explanations of constitutional development patterns. Part II explores the interplay between electoral systems and constitutional engineering, the internal costs of political coalitions, and campaigns in pluralistic elections. Part III investigates the quest for stable, dynamic federal states with particular attention to opportunities and pitfalls in Europe. With a foreword and contributions from Nobel Laureate James M. Buchanan. In the short space of less than a decade the political landscape of the world has changed dramatically. The fall of the Berlin Wall has brought into being many states with strong desires but little experience with democracy. In addition, the political climate in many of the world's democracies has been far from still. Italy, New Zealand, and Japan have all undertaken major changes in their electoral systems. Many experts describe the political landscape in the United States as being the most polarized in living memory. In the former Soviet Empire and in many former authoritarian states, there is the widespread desire to roll back the power of the state and implement the popular will. Simultaneously there is the wish to utilize the second-mover advantages of starting with a clean slate to pick and choose the best system, learning from the experiences of the democratic world. The collapse of the centrally planned economies has also undermined the authority of governments in the democracies of the world. This has led to calls for a re-definition of the core functions of the state. Furthermore, electorates in the democracies are becoming increasingly critical of their political establishments as globalization makes life more and more uncertain. These critiques have fueled demands for changes to limit the powers of political agents and to make them more accountable to their constituents.